When one thinks about how collective decisions are made, voting is the method that comes naturally to mind. But other methods such as random process and consensus are also used. 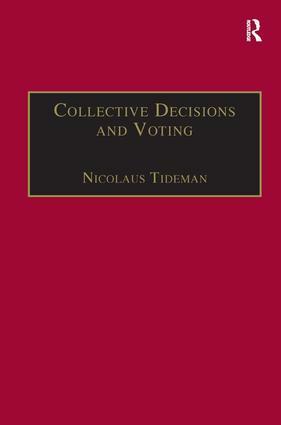 This book explores just what a collective decision is, classifies the methods of making collective decisions, and identifies the advantages and disadvantages of each method. Classification is the prelude to evaluation. What are the characteristics of a method of making collective decisions, the book asks, that permit us to describe a collective decision as good? The second part of the book is detailed exploration of voting: the dimensions in which voting situations differ, the origins and logic of majority rule, the frequency of cycles in voting, the Arrow and Gibbard-Satterthwaite theorems, criteria for ways of cutting through cycles and the application of these criteria to a variety of rules, voting over continuums, proportional representation, and voting rules that take account of intensities of preferences. Relatively unknown methods of voting give voting a much greater potential than is generally recognized. Collective Decisions and Voting is essential reading for everyone with an interest in voting theory and in how public choices might be made. Contents: Preface; Part 1 Collective Decisions: Defining a collective decision; A taxonomy of collective decision procedures; Economic criteria for evaluating collective decisions; General criteria for evaluating collective decision procedures; Relative advantages of modes of making collective decisions; What is a good collective decision?. Part 2 Voting: An overview of voting; Majority rule and its weighted analog; Voting cycles; The Arrow Theorem; Strategic voting and the Gibbard-Satterthwaite Theorem; Criteria for evaluating ranking-based vote-processing rules; Vote processing rules for selecting one option from many when votes have predetermined weights: alternatives to plurality; Vote processing rules for selecting one option from a continuum of one or more dimensions when votes have predetermined weights; Vote processing rules for selecting more than one candidate when votes have predetermined weights: proportional representation; Vote processing rules with endogenous weights for self-interested advocates: revealing intensities of preferences; Lessons from the excursion; Bibliography; Index. Nicolaus Tideman is Professor of Economics at Virginia Polytechnic Institute and State University, in Blacksburg, Virginia, USA. He has been there since 1973, as a post-doctoral fellow, Associate Professor, and Professor since 1985. He has published many professional articles, primarily in the areas of urban economics, public finance, efficient public decision-making, and economic justice.